These shoes are just so decadent. You'll definitely be the bell of the ball with these shoes on. It's the holiday season and you know that means parties, parties, parties! And with these shoes on you're sure to "wow" at them all. I love the fringe, that's my favorite part. The way it drapes down the shoe in a criss-cross motion. And the straps are adorned with a gorgeous gold square pattern. 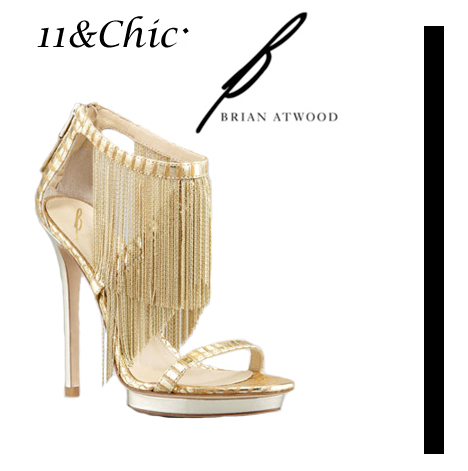 These 5" heels are sure to make a statement at your next holiday party. So tell me, what do you think? Do you like these heels? Are they your type of shoe for your next holiday party? Be sure to leave a comment in the comments box below, I read and respond to every comment that's made and I can't wait to hear what you have to say! Have a great weekend and I'll see you next week with more glorious size 11 shoes!